•	There are few responsibilities more basic or more important than making sure the food our families eat is safe. 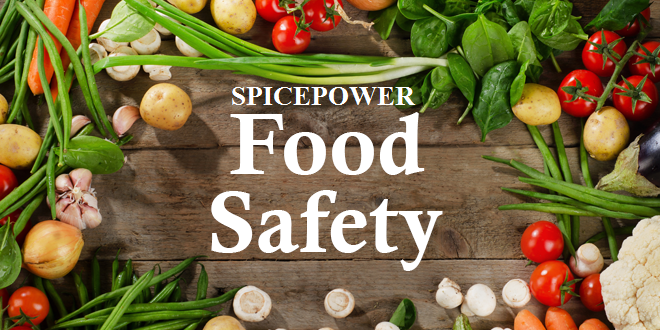 Food Safety is a daily and operational priority at SPICEPOWER. We incorporate several food safety processes and programs in our operations, affiliated with respected organizations that support us in our commitment to providing safe, quality products. •	HACCP Program: Our Hazard Analysis and Critical Control Point system is designed to address all reasonably occurring physical, chemical and biological hazards for each of our raw materials. •	Testing: Various microbiological testing protocols are an important part of our Quality Assurance and Food Safety Program. •	Suppliers: SPICEPOWER rigorous Suppliers Approval Program is supported by both physical and self-audits, with supplier performance tracking and ranking based on strict adherence to customer specifications.